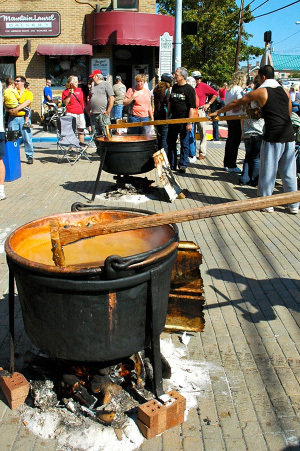 Star of this traditional fall festival is dark and spicy apple butter, made the old fashioned way-slow simmered in giant copper kettles over open fires in the center of the town square. Constant stirring is a must and passers-by are encouraged to take a turn with long-handled, spoon-bill stirrers. Apple butter making begins each morning of the festival before dawn, and the fires are kept stoked all day long. It concludes by late afternoon when the bubbling apple mixture is sugared and spiced and long lines of festival goers form to buy the butter as it’s canned, hot out of the kettle. Apple butter made before the festival is also available for sale from more than a half-dozen vendors. Apple butter makers at the festival include Pleasant View Community Center and the Stotler family. The winner of the apple butter tasting competition is announced from the bandstand early Saturday afternoon. The ingredients for the apple butter are simple. Bushels of apples (10-12 for a standard 40 gallon kettle) are peeled and quartered in a process called snitting. They are stewed in cider and stirred continuously for nearly eight hours. Sugar is added, and spices too. Cinnamon and cloves in either oil or powdered form are the favorite tastes. Every group has one person who decides the amount and taste to add. Once the butter is thick enough to stick to an upside down saucer, the butter is done and ready to be canned. The best task waits for last-cleaning the remnants of butter from the insides of the copper kettles with fresh baked bread. What to do with apple butter. Eat it on just about anything from bread to crackers. In the middle of a cold winter day, it’s perfect taste of fall harvests. Check out how to make apple butter at home.